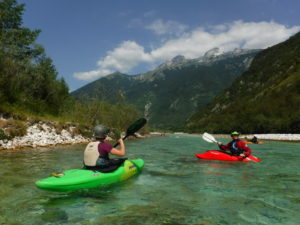 Every year we try to put together a European kayaking trip to find some white water in the sunshine. The last few years we have been to Austria but this year we decided to try Slovenia. Dates were set for mid July and finally, after much waiting and planning, it was time to go. We had 3 cars going with 10 people in total. 4am Friday morning myself and Sarah started the 1000mile drive to Bovec in Slovenia (07:30 ferry). We left a day earlier than the rest of the group as we had planned a day climbing on route down. However, the journey on the Friday involved us sitting in so much traffic that we were not going to make the planned campsite so we had to re think. We found somewhere to stop and carried on the next day. Our initial plan was to climb in France but we hadn’t even got as far as the campsite and had 8 hours of driving planned on the last day. We therefore needed to make up some distance. Saturday morning we were off again heading east which was at least the right direction. Still with about 13 hours of driving to go we decided we needed to rescue the trip out so as not to spend 3 days driving instead of the planned 2. 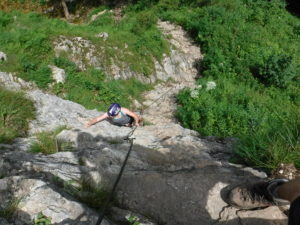 The result being we found a great little via-ferrata just inside Germany. We spent a few hours on that which turned out to be a great day and a save for the journey out. After camping that night, we finally met the rest of the group at the campsite in Slovenia. The temperature was hot and the humidity was off the scale. The camp was set up at the top of a very slippy gravel track, out of the way of everyone else, so we had the whole field to ourselves. Dave with his carload had already put their tents up and Andrius and Santa had theirs up too. Beers were opened and the start of a great week began. The plan (there isn’t really a plan more of suggestions) was to paddle different sections of the river each day. If people wanted to do other stuff whilst on holiday too, they were more than welcome to. 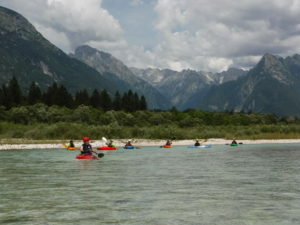 The first day we paddled an easy section just to get warmed up and get the group used to the water and each other. The scenery out there is just stunning, the water is crystal clear and temperature i s hot. This makes for perfect paddling conditions with only a rashvest, spaydeck and buoyancy aid needed. 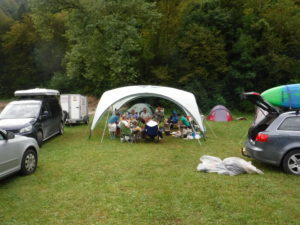 The evenings are usually taken up by all sitting round the BBQ until it gets dark or sitting in the bar that was on the campsite. The next few days had us paddling different sections of the river, usually with me leading down. 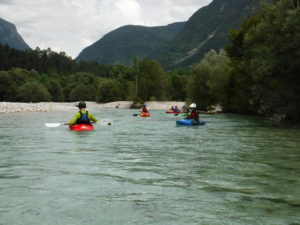 Quite often I would let others take the lead too, especially James who loved the chance to have a go on a new river at the front. Due to the amount of rocks that seemed to get in peoples way the amount of swims seemed to increase over the week. This wasn’t a problem due to the air temperature. Towards the end of the week we planned to paddle a section called the classic section. Myself and TomTom had scouted it the day previous and deemed it to be great fun and knew the whole group would enjoy. Due to the size of the group we needed to split it into two groups. However, I was needed in both groups and we were combining it with the section above, thus a plan was needed. The plan was that on arrival at the classic section, 3 people would get out and wait on the sandy beach for an hour whilst I would take the first group down. I would then get a lift back to the top and run it again with the others. They were more than happy to chill out on the beach in the sunshine for an hour. I set off with the first group. We had a couple of swims, one of which resulted in much hilarity due to 3 of us not being able to throw a throwline across the river to re-unite the boat with its owner. Within about 15mins of leaving the others on the beach, the air temperature dropped and the heavens opened to an epic downpoor. Upon our return, they were sheltering under a tree, very wet and a littler colder than they thought they would be. We got on and paddled the classic section. Matt managed to get his boat pinned on a scary looking undercut rock and lose his paddle which resulted in a quick paddle swap type rescue that seemed to impress all that saw. 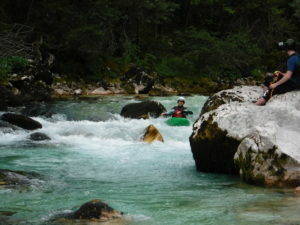 The next day we decided to have a go at a tight technical pool drop type section of the river. This section took us quite a while to get down simply because we needed to set safety up on nearly every feature. At one point I was dealing with Adrian’s boat after it decided it didn’t need him anymore and would kick him out mid river. I instructed Dave to take his son down to the next eddy but, after hitting the same rock, they managed to simultaneously exit their boats. One perfect full 15m throw line deployment later and they are emptying their boats as well. Everyone back in the boats and we were off again. The next feature was a technical rock slide, brace paddle type move. We looked at it, we looked some more and some decided to walk round. 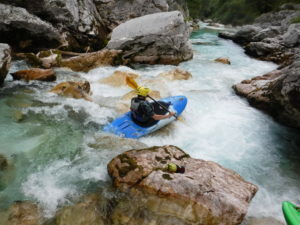 Andrius had a go and just missed one of the crucial moves resulting in a swim and his boat being pinned mid rapid. Once everyone was back in the right place we completed the rapid and then headed back to the cars and back to the campsite. On the way back to the campsite each day we would stop at a local supermarket to pick up food and drink for that evening and breakfast etc. The last Friday evening we had a meal in the local pizza restaurant after packing all the tents away ready for the journey home. Saturday morning (early) we set off making the 1000 mile drive back to Northampton after a great week paddling.